The folk world has its projects whereby musical connections are made which heighten awareness concerning the indebtedness different cultures have to one another: in that spirit, parallels and future avenues are explored. In terms of connecting Celtic music and African culture, the Afro-Celt sound system is notable for their electro-rave approach; the 'music cycles' project connected Mali and English roots; Edward II fused English country dance with reggae; the Breton Bagad Men Ha Tan joined forces with Doudou N'Diaye Rose (Dakar, 2000 L'Oz); heck, even Davy Graham, and The Pentangle, got down into American blues and jazz as they flung back the curtain on music's tributary paths. The trio Serendou, on their second album Zinder, are in this excellent tradition of cultural exchange, when two musicians from Niger meet with a Breton flautist. Serendou are comprised of Yacouba Moumouni (flute, vocals), Boubacar Souleymane (singer, percussionist, guitar and kountigui – a one-stringed lute), and Jean-Luc Thomas (ebony flute, electronics, vocals). Jean-Luc Thomas is also one of the founders of the Hirustica label, which features several cross-cultural projects, delving into India, Brazil, and South America. 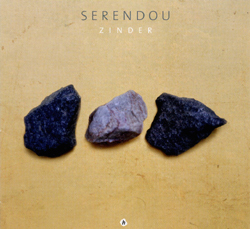 Zinder's substance is thrilling on several counts. The musicians go deep into Nigerien music, and “Aikin Yara” sets the stage with its call against child labor. The tune shimmers, and the flute playing brings to mind the circularity that one hears in Breton music – a round, call-and-response rhythmic sway that characterizes a lot of the album. Thomas allows the Breton character more expression at the end of the tune. There is also the introduction of guest Michel Godard's tuba into the track, which adds both bottom and heft. The tune “Zinder” is a suite of six-beat ridées, two flutes working in tandem, undergirded by tambourine. The track changes dramatically, with pulsating bass and a kind of cosmic whistling, and it's as if Ian Anderson from Jethro Tull opted to sit-in. “Samaro Bankilaré” begins in an experimental fashion, with breathing both in and out of flutes, making them sound like miniature rainsticks. From there, the song – which celebrates the secretary general for the youth of Bankilaré, exercises call-and-response between vocals and flute, and the rhythm settles into trance; it is terribly exciting, and beautiful. What is just so enjoyable about Serendou's sound is how Thomas fits with his Nigerien bandmates – the emergence of Celtic-sounding themes never appears out of place. For instance, the lengthy track “Hardouyounoussou” (“The Warrior”) has a pleasant, flowing stepped rhythm. It is predominantly steeped in the sounds of Niger, but curving above it are the Celtic tracings of Thomas, who then sinks back down into the African traditions. The song builds into an incessant trance, thickly layered with whirling flutes and plucked strings, all of a piece. Zinder is RootsWorld's Music of the Month Selection for January, 2017.